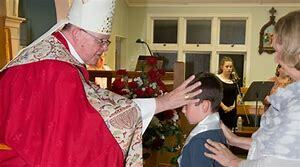 Having promised to bring your child up in the “practice of the faith” at his/her Baptism, now the next step in their Initiation is the Celebration of the Sacraments of Confirmation and Eucharist (with their First Communion). After the following General Information, you will find specific links and information for the current years Programmes. At the Baptism of your child, one of the blessings recognised you as the parent(s) being the “first and best educators of your child in the ways of faith” and the Godparent(s), on behalf of the believing community promised to “help the parents of this child in their duty as Christian Parents.” Our Sacramental Programme reflects the commitment the Godparents made on our behalf – we will help you parents as you continue to educate your child in the ways of faith. Normally around late May/early June we advertise for parent(s) to come to an Introduction Meeting (which is not optional) to find out more about the programme and then to enrol in the actual journey of faith with their child(ren). The Sacrament of Confirmation is celebrated somewhere around September. 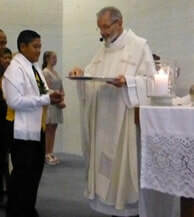 The child receives his/her First Communion at the usual Mass the family worships at. The date of this is after he/she and the parents have finished all the programme’s requirements and the parents consider the child ready. (There is no “First Communion” Mass with all the children from the programme celebrating together). Faith is a journey and develops in different ways in different people – it’s not a programme with the same starting and finishing time. Click here for detailed information about the Parish Sacramental Programme. The RCIA, also called the Catechumenate, is the process by which adult persons are brought into membership of the Roman Catholic Church. A chance to discover more about who I am as a son or daughter of a gracious and loving God. A time to reflect on what this relationship means to me and what it may ask of me. An opportunity to come to know Jesus Christ. Stafford Parish RCIA Team meetings are held once a month. Special group meetings for all those involved in the RCIA are held several times a year. If you need any more information ring Fr Denis at the Office, drop in or see him after Mass. Also, several times a year, relevant information regarding the RCIA appears in the Parish Bulletin.